Leapfrog provides a wide range of educational DVDs with engaging plots and catchy sing-along tunes to delight preschoolers and beyond. The storylines are highly entertaining for little ones and there are plenty of valuable educational milestones covered in a fun way that children can easily absorb. Leapfrog Maths Adventure to the Moon follows the adventures of Tad and Lily as they head on a trip into space with their friend Edison the firefly. To complete their school assignment the duo set off to the moon in search of ten specific things. They land on moon rocks and a learning path guides them to a rocket ship where they make counting to ten, times tables, sorting and patterning fun and engaging to toddlers and preschoolers. The highlight of the DVD is definitely the music which is rich in catchy tunes such as ‘Maths is Everywhere’ and the ‘Counting Song’. These ditties are guaranteed to get young mathematicians up and dancing. The DVD is jam packed with fun filled ways to enjoy maths and offers invaluable insights into how it relates to everyday life. The main film lasts just 37 minutes and, being so highly entertaining, parents may wish at times it was just a tad longer. In addition to the main film there are two excellent special features, along with a preview of the Leapfrog Let’s Go to School DVD. The sorting game is simple enough to entertain toddlers with the help of an adult and the sing-along section gives children another chance to join in with the foot tapping songs. 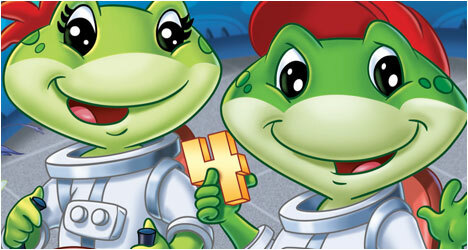 Until May 16th you can win one of three copies of Leapfrog Maths Adventure to the Moon over at MyKidsHealth.com.